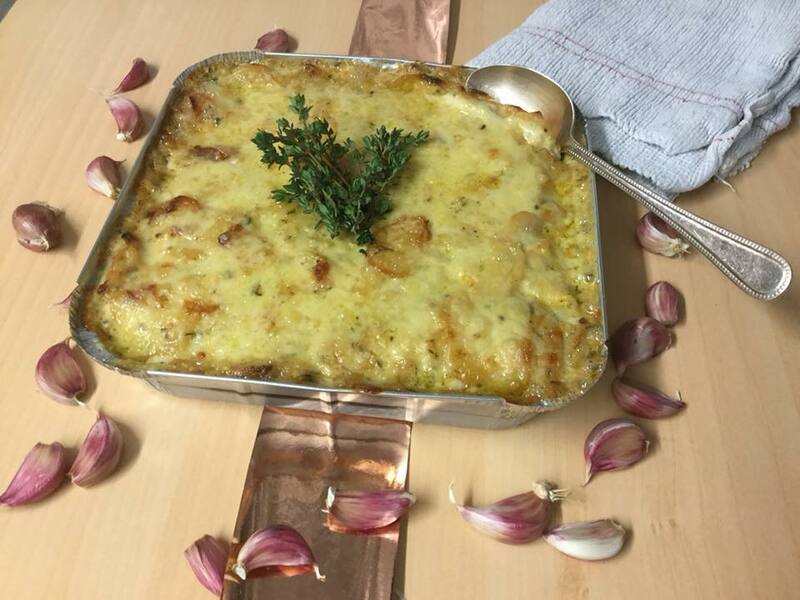 "I've had dauphinoise potatoes in a lot of restaurants around the world, even in France" said one of the guests we were cooking for a few weeks ago "... and I have to say yours were the best I've ever tasted!" Dauphinoise Potato - The Recipe! Serves 14 if you're having a 3 course meal or 8 if it's a one course. A lot of people come back for seconds. Its also fine to refrigerate when cold and re-heat another day (see below). Makes a 23cm square x 3.5cm deep square foil tray. I used to use earthenware lasagne dishes to make dauphinoise when I first started out, then found the waiting staff washed them after use and put them away in the cupboards of the holiday houses, so I started using disposable ones. Good thing with these though is: NO WASHING UP! You could factor the amounts in the recipe below to suit your size of dish. 200g Gruyère cheese: 150g in the potato dish, 50g topping after it has finished cooking. Preheat oven to 190 oC (depends on ovens. I find my industrial fan oven is better at 180 oC). Bring cream to boil and reduce to medium heat. Keep stirring/ whisking occasionally till it reduces by a third. This may take 10 + minutes. As it starts reaching the 1/3 mark the chance of it burning to the bottom of your pan increases immensely, so you really want to keep an eye on it. So many times I have had to change pans which means extra washing up, and nobody likes that! I.e. stir it more often as it's going. When the cream is reduced by 1/3 add the potatoes and mix in thoroughly. Add the nutmeg, garlic, thyme, salt and pepper. Mix in, and allow to cook down for about 15 minutes on a medium heat, making sure you stir occasionally as it will burn to the bottom of the pan if left. This 15 minutes of cooking down stops it from going grey in the oven (see below). Add 150g gruyère and mix through allowing to melt for a minute, then mixing in again. Taste your dauphinoise for seasoning, garlic or gruyère. Need any more? Adjust to your liking, remembering it needs to be slightly saltier than you think as the potatoes absorb the salt during cooking in the oven. Once the cheese has melted transfer the dauphinoise to a baking tin and smooth off the top. Now place in a deeper tray and fill with hot water 2/3 way up the side of the dauphinoise tray and cover the top with foil. Cooking it in a bain marie like this saves the edges from burning. Covering the top with foil means it cooks through rather than burning the outside and leaving the middle raw. Bake in the oven for 75 minutes till soft when prodded with a sharp knife. Then remove foil, sprinkle with more cheese (the 50g remaining) and replace in the oven for a further 8 minutes to allow the top to gratinate. 1 - Start with the best potatoes. The desiree potatoes which come out of my friend's garden are the best, as seen in a dish last year. King edwards are next in line, then estima, then Maris Pipers. Desiree seem to have a distinctive flavour, and a creamy texture. Roosters are also great! 2 - Use a mandolin to slice your potato - so you get even thin slices without cutting your thumb while slicing with a knife. Instead of the mandolin you can upgrade to your food processor for speedy dauphs. Use the guard for the mandolin as you want to slice the potato, not your fingers. I have seen some very nasty accidents with people using madolins - the worse thing is when you get complacent, start thinking of the next thing you have to do, or someone calls you while you're slicing, you look round, and suddenly you're on your way to casualty. 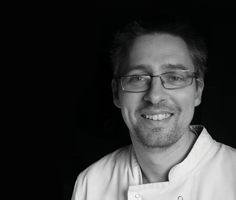 In one particular incident at Claridges we sent one chef off to sit down when he felt a little faint after a nasty mandolin cut, blood dripping through the gauze he held to his finger. When the first aider took a look it, the end of the finger was missing. After careful inspection by his co-worker it was found next to the pile of cucumber he had been cutting on the mandolin. Luckily they were able to sew it back on at casualty. The moral? use the guard, and keep paying attention. 3 - Before you start slicing the potato you have put your double cream on simmer to reduce. By the time you have finished slicing it should have reduced by more than half - like the concistency of sticky toffee sauce (but not the colour obviously). Now mix the potatoes in thoroughly and allow to cook on low heat for 10 minutes turning frequently. This produces firmer dauphinoise which you can cut out with a cutter. Also the more cooking you do on the stove first the less time they take in the oven. If you want softer dauphinoise you just add more cream. 4 - Gruyère cheese is the classic cheese to use for dauphinoise, but, when making it at home in the Cotswolds I often like to use St. Kennelm from the nearby award winning Gorsehill Abbey Farm. You can also layer purple potatoes in there for a colour variation. You could also mix in grain mustard, chorizo, dried onions or a number of other items for different flavours, though I prefer to keep it plain to please most people. 5 - Easy way to clean the saucepan after making dauphionoise - fill the finished pan with water and leave to soak for at least 2 hours, preferably overnight. You will then find the dauphs stuck to the bottom of the pan come off very easily with the help of a dessert spoon and stainless steel scrubber. Why have my dauphinoise gone black on the top? Oxidisation. Potatoes naturally go brown then black once they are exposed to the air. This is counteracted by either putting them in water or cooking them. If the potatoes are going grey on top of the dauphinoise it means they're not being cooked fast enough - oven temperature is too low, or you put them in to a cold oven. If you cook the potatoes first (as described in 4, above) this shouldn't happen. This can also happen at certain times of the year (crossover between the seasons), and also if the potatoes have been dug after prolonged periods of rain. You should also keep potatoes out of the light - either sunlight or electric light. Despite their appearance however, they are fine to eat. Can I freeze dauphioise potato? Yes you can. Once cooked, leave it it cool. Once cool you could either cut it out into portions (either square ones with a knife, or round/ oval with a pastry cutter) and freeze them, covered, on a flat tray. Or you could just freeze it whole in the tin/ dish you cooked it in. You can either leave it to defrost in the fridge overnight or re-heat from frozen. Re-heat in the oven or microwave - though it is best in the oven because it crisps up on the top. From defrosted/ chilled, the cut-out individual portions just need 3 minutes in the microwave (750 watts) on a plate and covered with cling film. About 15 - 20 minutes in the oven at 180 oC. If re-heating from frozen increase the cooking time. You are best leaving a large frozen tray to defrost overnight. If not though, if using the oven, cover with foil to begin with so the top doesn't burn before the middle is near luke warm, remove foil for the last 15 minutes. Instead of using a large tray as above you can spoon them into individual ramekins - one ramekin per portion, cover with foil and cook for around 45 minutes. Remove foil for 5 minutes to brown the top if necessary. These can be made the day before, chilled, fridged and re-heated as you serve your starter. Why has the cream split? Lovely post James I will have to try dauphinoise potatoes your way!! Great, this was just what I wanted to know! Nothing beats dauphinoise alongside home-baked ham and I can now happily make a big dish for boxing day and keep it in the freezer. Stress free Christmas. PS I have always used Gruyere, with some finely minced fresh garlic too.